Since I didn't snap a photo of the Aris Allen prototype, here's a version by Allen Edmunds, their "Strawfut," to give you an idea of the mesh and leather combo, but with a $300+ price point. 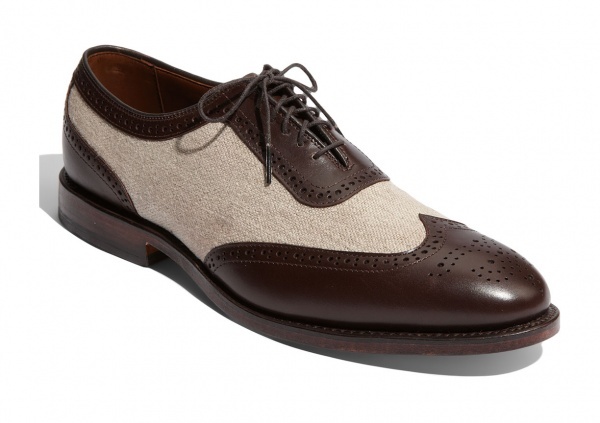 I’m a big fan of the Dancestore.com mesh and leather heeled oxford for its comfort, flexibility, and breatheability. I can imagine that the same concept will translate well into an oxford for men. Kudos to Dancestore.com for picking up on this functionality. Did I think to take a photo of the prototype? No, of course not, but the shoe I saw was two tone, with dark brown leather and tan mesh, and was copied from a 1940’s pair of the same coloring. Gay said they would also be available in black leather/white mesh, and possibly a black and navy combo. This entry was posted in Gentlemen, Shoes and tagged Aris Allen, Balboa, black and white, brown and tan, Charleston, dance, leather, Lindy Hop, mesh, oxford, Shoes, swing, two tone, wingtip. Bookmark the permalink.